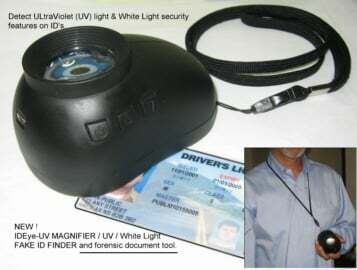 The ID-e110 is a user friendly UV and White light Magnifier for Analyzing Card Security features of UV and Micro Print. Also Cross – over or alternating light source chip controlled led’s illuminate from upper to lower led’s to inspect surface conditions, or lamination flaws. No other device gives the flexibility of low cost and high end visual analysis of cards like the HS110.